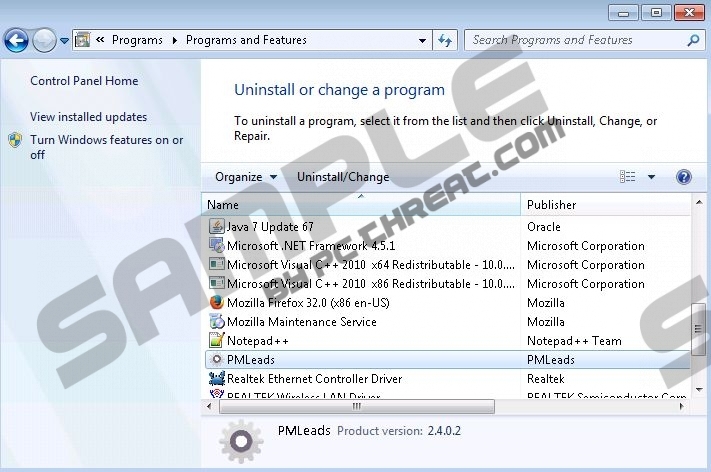 PMLeads, or PufferMind, is an advertisement-supported program which you must delete from the Windows operating system right away. Unfortunately, many users do not understand that they need to remove PMLeads to stop the flooding advertisements, because the program is promoted as a security tool. Needless to say, the application is promoted in a misleading manner, and this is just the first reason you should delete it from the computer. The official website presenting the program is puffermind.com. The tool promoted on the site should optimize the computer, diagnose and repair software or hardware errors, and remove viruses. Does PMLeads meet its promises? Of course, it does not. Instead of enabling anti-virus protection, malware removal, or system optimization services, this suspicious application presents online advertisements. PMLeads does not run browser extensions which communicate to remote adware servers; however, it creates a local proxy which can be used to place sponsored links. Needless to say, the suspicious ads will keep showing up until you delete the advertisement-supported program. If you have installed PMLeads, it will not be difficult to identify the pop-ups and the banner ads flooding the websites that you visit; however, if you install the program identified as PufferMind, you may have no idea that ads “Provided by PMLeads” are related to the suspicious application. Keep in mind that ads with different tags, or no tags at all, could show up as well. The truth is that you may have to delete various other applications if PMLeads has been installed, because this program rarely travels alone. According to our malware analysts, PMLeads is usually bundled with third-party applications which are carried by Vittalia, Premium, DomalQ, and other third-party installers. It is impossible to know what programs the advertisement-supported program will be installed together with. While some computer users may have to delete potentially unwanted programs and adware, others may have to remove keyloggers, Trojans, and other unreliable software. Unfortunately, you may face the same removal issues if you allow the installation of DonutLeads, PastaQuotes, or other PMLeads clones. You cannot postpone the removal of PMLeads. Even though the application may not seem like a huge threat, it could expose you to different security backdoors, and this is extremely dangerous. Different security vulnerabilities can be used to infiltrate malware or introduce you to camouflaged phishing scams. If you are not experienced and you cannot delete PMLeads manually, you must install automatic malware removal software. We also recommend that all users employ reliable security software. Select Control Panel to open a new menu. Click the Windows button on the left of the Task Bar. Select Control Panel to open a menu. Click Uninstall a program and find PMLeads (or PufferMind). Access the Metro UI menu and right-click on the screen. Quick & tested solution for PMLeads removal.